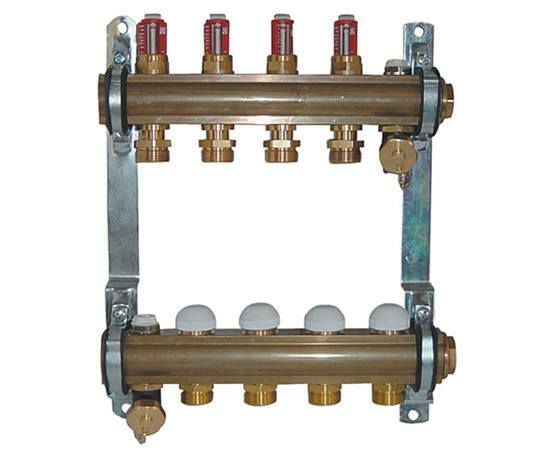 The PN10 manifold with top meter is a rod-type that is used for the distribution of the individual heating circuits in floor heating systems. Each heating circuit can be controlled and shut-off separately. 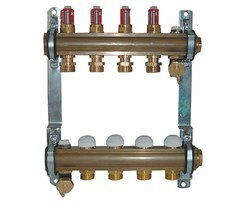 • Rod-type distributor sets with shut-off and thermostatic upper parts. • Rod-type distributor sets with thermostatic upper parts and top meter control inserts. • Single take-off sets (extension sets). • Shut-off valves in straight and angled models. • Compression unions for copper, steel and plastic pipes. The distributors are mounted onto the wall or in a distributor cabinet on holding devices. The distributors are closed by a plug on one side.